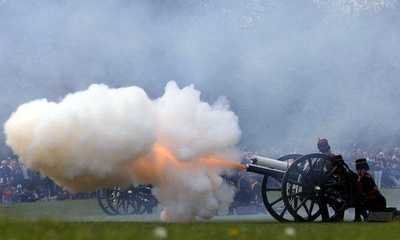 This afternoon volleys were fired by soldiers in Hyde Park and the Tower of London to honour the arrival of the new princess. Shown are the King's Troop Royal Horse Artillery firing a 41-round gun salute in Hyde Park. Later, Kensington Palace announced that the Duke and Duchess of Cambridge have named their daughter Charlotte Elizabeth Diana. Charlotte is the feminine form of Charles. Her official title will be Her Royal Highness Princess Charlotte of Cambridge. I'm glad that's all sorted out (CLICK).